From 10 June - 6 September, Museum Tinguely hosts the most extensive exhibition to date of work by the London-based artist Haroon Mirza (born 1977). Mirza’s large spatial installations often include sound, light, video and film as well as randomly found objects and works by other artists. In this way, Mirza creates an immersive experience that challenges the eye, the ear and our spatial orientation. By showing existing works alongside several new pieces created especially for the exhibition and specific to the site where they are placed, Museum Tinguely presents the work of Mirza across a broad spectrum. 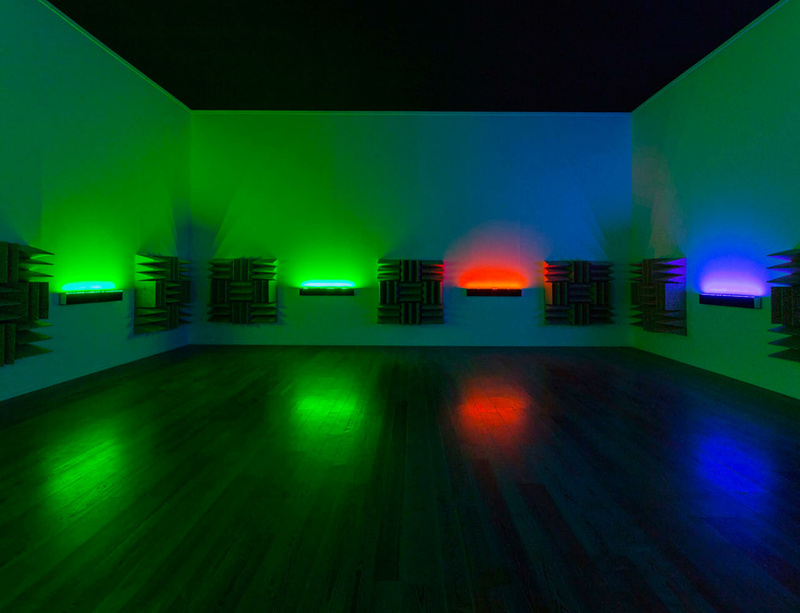 The ‘Haroon Mirza/hrm199 Ltd.’ exhibition focuses on the collaborative nature of the artist’s practice. The exhibition’s title, the name of Mirza’s studio and company ‘hrm199 Ltd.’ implies the essence of his approach. Artistic work is inherently a process with many contributors. It includes co-workers in the studio, the architect or the people involved at the museum as well as other artists. In this case the latter includes Alexander Calder, Channa Horwitz and Anish Kapoor, all of whom have either contributed their own work or engaged in a creative dialogue to lead to artistic innovation. Various forms of interaction such as appropriation, dialogic structures and complicity between the different contributors including the act of curating itself are presented. Accompanying the exhibition there is a catalogue that takes an experimental format by rendering the creative and practical interactions visible, mirroring the creative processes in the exhibition itself. Haroon Mirza studied painting, design and theory at the Winchester School of Art, Goldsmiths and at Chelsea College of Art. He rose to international fame in 2011 when he was awarded the Silver Lion at the 54th Biennale of Venice. In 2014 he also received The Zurich Art Prize and The Nam June Paik Award. Mirza’s artistic creation is a permanent experiment within which critical analysis and categorisation of art production are investigated. His sound, light and media installations are characterised by formal precision as well as the development of complex narratives. They appeal to the sense of vision as much as to that of hearing and explore the relationship between the two. The site-specific installations create a multi-layered dialogue between the materials used including audio equipment, LEDs, solar panels as well as found footage and works by other artists. At times, the artist’s own creations are transformed back into material that is to be integrated into new works. A recurrent theme is ‘Mis-use’, the creative alienation and transformation of apparatus and its associated functions used as a strategy to break with established functions and to extend possibilities. With artistic procedures of appropriation, the use of ready-mades and reverse ready-mades, as well as the incorporation of self-governing systems, Mirza questions the conditions under which art is produced and playfully deconstructs the role of the authors and artists. How far are solo-exhibitions, against a background of deconstructed authorship, inherently group exhibitions? This a question on which the exhibition ‘Haroon Mirza/hrm199 Ltd.’ focuses by presenting a wide variation of artistic co-operation. Within Mirza’s oeuvre of works which develop co-operative practices, a key example can be found in the piece An_Infinato (2009) which combines footage of Guy Sherwin’s film Cycles #1 (1972/1977) and Jeremy Deller’s video Memory Bucket (2003). By way of contrast the installation Sound Spill (Second Edition) (2009/2015), curated by Mirza and Richard Sides, retains the integrity of the three film and video works used, whilst at the same time formulating new connections. In an artistic dialogue Mirza responds with a sound and light installation to the conceptual drawings by Channa Horwitz. A catalogue accompanies the exhibition which provides a platform for the presentation of the rhizome-like structure of creative as well as practical interactions.